Considering the talent involved, it’s hard to believe everyone agreed to star in a film this goofy and shallow. Especially, by actors like Sean Penn, Ryan Gosling, and Josh Brolin who have recently been very selective about their work. Gangster Squad appears to have done its homework considering its 1940’s backdrop. Its attractive period style, make-up and costuming convince us the film will have more weight to it since more effort is being put into it – making the surprising end product that much more jarring. I don’t feel bad for saying I was entertained by Gangster Squad. Even though I understood I was watching good-looking actors ham it up in fedoras, the film managed to draw me in with its over-the-top violence and exciting car chases. But, because the film stays as deep as a frisbee and the exaggerations become as loud as a bullhorn, I question if my interest towards Gangster Squad kept its initial form. My enjoyment seemed to have evolved into something more unintentional that wasn’t intended by filmmaker Ruban Fleischer. 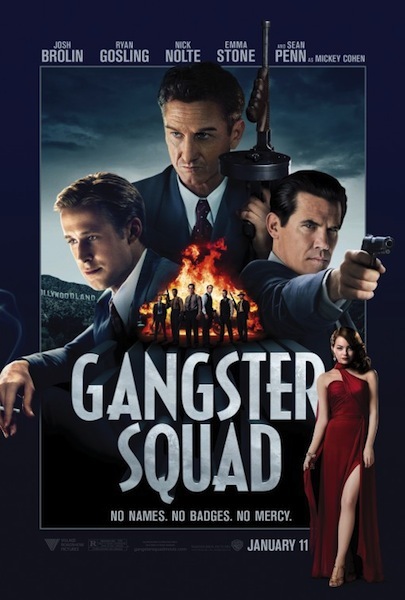 And therefore, even though I was never bored, I can’t call Gangster Squad a full-fledged success…or even a good movie. It just is what it is. The story about a group of renegade police officers and slicksters who decide to take the law into their own hands in order to chase a kingpin out of Los Angeles does the trick, but never feels the need to dig into the shadiness or the characters audiences are supposed to be rooting for. Our heroes aren’t even the usual task force with their own set of unique specialities. Everyone sort of blends into each other, which isn’t a good way to establish a movie’s good guys. Penn chews up scenery as mobster Mickey Cohen and the production has done a lot of work to cover his familiar face with prosthetics. We still see its Penn and even though we admit the versatile actor is clearly out of his element, he fills his meanie quota well. He truly comes across as a scary intimidating individual you wouldn’t want to meet in a dark alley. The rest of the cast are not as memorable because everyone is wearing such a straight face. Also, like Will Beall’s screenplay, it seems the ensemble hasn’t been told to – or voluntarily – make these roles into anything rounded or special. This usually leaves movie goers wondering why certain actors chose to perform the way they did. For instance, Gosling’s vocals are cartoonish and two octaves too high. It’s a very big distraction from what Beall’s script has him saying. I watched Gangster Squad in the same way youngsters would read colourful comic books in their tree house. 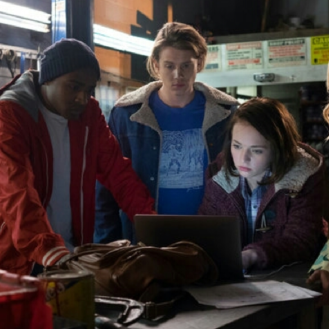 It’s a literal adaptation of a 70 page comic book (minus ads for decoder rings and Hubba Bubba) and if you take the film at face value, you may find yourself having as much goofy fun as I was having. However, I wouldn’t have been opposed if I walked away liking Gangster Squad for its hard hitting authenticity and gripping suspense instead of liking it as nothing more than a guilty pleasure.